Adopts UHF wireless ID pairing technology, supports 10 variable channels, and allows multiple sets using in a band simultaneously. Built-in 5 professional guitar effects(original clean/ bluesy/ flanger/ tremolo/ metal), meet your different playing needs. 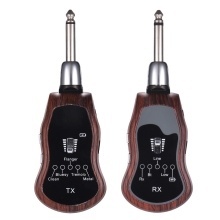 The transmitter has built-in amplifier, can be connected earphone or speaker to work independently by 3.5mm output jack. The receiver supports BT and line-in function, you can connect your smartphone with the receiver by BT or 3.5mm audio cable to play background music. The transmitter and receiver both with built-in rechargeable lithium battery, allows you to use them anytime and anywhere.